Here I am, I arrived in Nancy, France yesterday, my hometown…jet lagged as ever and since everyone is still sleeping at 4 am, I thought of finishing this post, that I had started over 6 months ago. It feels good to be home, that’s all I can say. Everything feels right. If I can find fregola in France, I will buy it and have my parents try it. Even though, they’re from Italy, but are not very familiar with Sardinian cuisine. I love those tiny Sardinian pasta balls, they’re hearty, rustic and irregular, they remain al dente and are delicious in so many different ways. I love rustic pasta and ingredients that remind you of old traditions and cultures. You can find those in any Italian grocery store or at the Rainbow in San Francisco. They’re imported from Sardinia and are served in Sardinian restaurants. I have never seen those served in traditional Italian restaurants. Fregola reminds me so much of my wonderful Sardinian friend Mauro (from Cagliari) who recently moved from San Francisco to London. He introduced me to Sardinian cuisine, and restaurants in San Francisco. Maurino, questo piatto di fregola l’ho fatto proprio per tè! If you’re in San Francisco and interested in tasting the delicious cuisine of Sardinia, you have to try out La Ciccia, it’s a real Sardinian restaurant where the chef and owner is born and raised in Sardinia. You cook fregola like you would cook pasta, in water then drain it and serve it with like you would serve pasta, with your favorite sauce. In Sardinia, they serve it with a lamb ragù. I cooked mine like a risotto, added scallops, then served it with a asparagus sauce, it was delicious and delicate. If you look at the pictures, you can see some crawfish in the fregola but do not really liked the quality of the crawfish so will not use it next time. I did not add parmesan cheese in the fregola, I am one of those who don’t add cheese in fish or seafood pasta dishes. 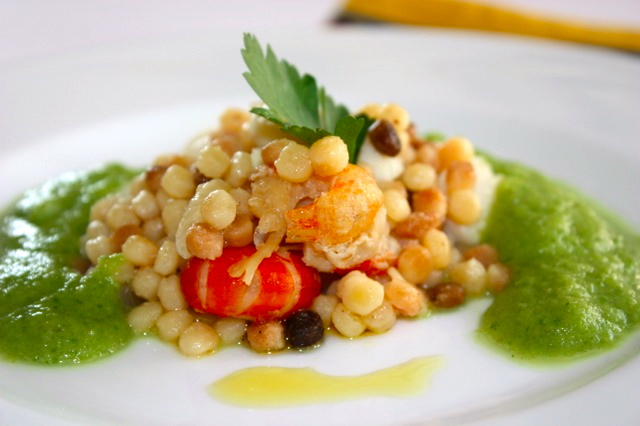 If you’re interested, more fregola recipe here. First start preparing the fregola like a risotto. Heat olive oil in a pan, add shallots and let it brown and softens. Add fregola, stir well. Add broth and wine gradually and keep stirring. Cook that way until the fregola has become soft but still slightly hard on the bite and al dente. Adjust with salt and pepper, add cream and stir well. Keep hot. Saute scallops in olive oil and add to the fregola. In a small pan, heat olive oil, add onions and cook until soft. Add asparagus and broth and let cook until asparagus are tender. Adjust with salt and pepper. Let it cool and blend in a mixer. Pass it through a sieve to obtain a smooth cream. 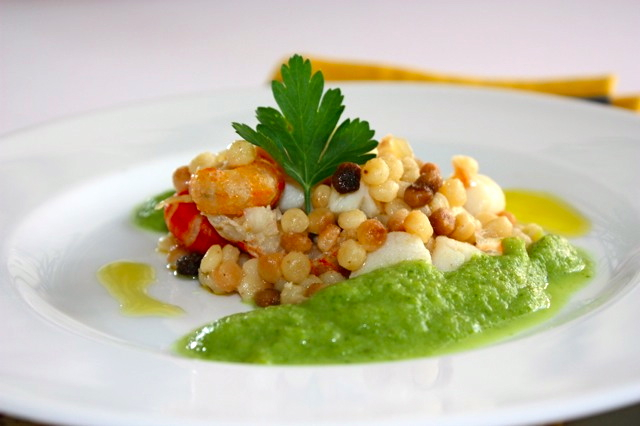 Serve fregola in a plate, add cream of asparagus all around and drizzle with lemon oil and parsley and serve hot. This entry was posted by silvia on January 18, 2012 at 6:37 am, and is filed under Fish/Seafood, Pasta. Follow any responses to this post through RSS 2.0.You can leave a response or trackback from your own site. I have some fregola that I picked up in Seattle. I have yet to try it but this seems like the perfect place to begin. J’ai justement un sachet de ces pâtes et je me demandais comment les cuisiner. Cette assiette me charme vraiment! I have not had fregola for a long time. I will be looking for it the next time I am in the city. I’m curious – did cooking the fregola like a risotto result in a creamy texture the way arborio rice does? Did you feel that it was worth the extra effort of slowly adding the liquid and stirring as opposed to just boiling and draining like regular pasta?